Congratulations to Ma. 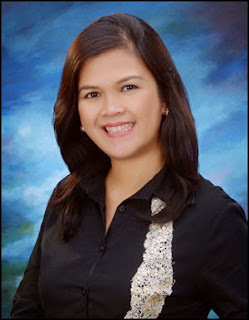 Lorna Eguia, the first Filipino librarian to be chosen as one of Library Journal's Movers & Shakers! Her work with victims of Typhoon Haiyan, specifically the bibliotherapy she offered to children through her Books in Bags project, is featured prominently in her citation as a Community Builder. Many people have told me that they want to help build public libraries, but often they think it will be enough to donate books. I tell them that book donations—and even new library buildings—are not enough. Someone has to be there to make sure that the books are taken out of the boxes, organized, and displayed. Otherwise, it is very likely the books will remain in their boxes forever. Someone also has to open the library on a regular basis, make sure the lights are working and the place is clean, AND tell members of the community about the library's resources and services. Otherwise, like many other public libraries that we have now, most of the people around them will not even know that there is a public library in their midst (see the NBDB Readership Survey 2012). In short, a librarian—or at least someone who loves books and is a full-time employee—must be hired if the public library is to achieve its objective. According to its website, Library Renewal Partnership (LRP) is "a coalition of local and international partners that aims to to empower over 2 million citizens, by building at least 200 community education centres by the year 2020 and help forge an interconnected archipelago of readers and leaders." 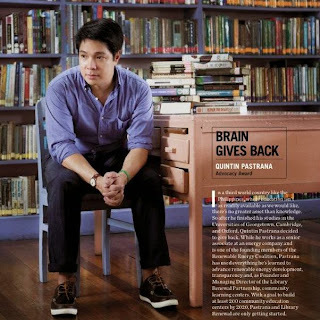 As Quintin Pastrana (LRP's founder) states in "Making a difference, one library at a time" (Philippine Star, 9 March 2015), "...the local government provides the physical structure, overhead expenses, and staffing, while partners and donors provide books, learning materials, and educational programs." How? They work with interested mayors to get a memorandum of agreement signed, which assures them that the local government will take care of providing the following: 70-square-meter space (minimum), Internet connection, and library overhead (including electricity and salaries). If you'd like to set up a public library in your barangay or municipality, there is no need to reinvent the wheel. Please get in touch with LRP. For more information about LRP, see their website and Pastrana's 2-part "Where have our libraries gone?" People I meet, after the perfunctory introductions are made, are usually surprised to find out I am a librarian. Reactions range from the demure "oh," with a slight twitch of the left facial muscles, to the "oh-no-you're-not," delivered with an abrupt plunge in tone of voice; skin slowly turning pale. Kidding aside, people I meet for the first time are genuinely interested why a young man in his 30s (because 30 is the new 20, haha) seriously considered and made a career out of being a librarian. A Librarian. Not Information Manager, Information Specialist, Information Analyst, or any other incarnation of the basic title of the profession available on the Internet nowadays. Why become a librarian? Why not a career in the arts or media, as befits my online persona or my gregarious self when in the company of close friends? I cannot claim that librarianship as a career path came to me like lightning-amidst-storm-clouds, an epiphany, or a mid-morning realization. No, it didn't. In fact, who would choose a career that upon mention will instantly fill one's head with images of old maids shushing the life out of unruly high school teens? LOL. Never in my wildest dreams; but it happened, one thing led to another—and now I’m all the more thankful for it. My life as an undergraduate Iskolar ng Bayan was mired with trials, hardships, and tribulations along the way in the form of 5.0s, 3.0s, INCs, and occasional sleepless nights on account of a paper, a report, or both. (It happens to most; not that I have a very unique life story in UP, haha!) I ended up, like most of us did back then (late 90s), at the steps of the UP School of Library and Information Studies, begging to be given another shot at UP Life. The shot was given, indeed, and before long I found myself poring over books on library history, cataloging and classification, indexing and abstracting, management, reference service, and information technology—all of those on top of the general education subjects that one has to pass in order to graduate with a UP degree. No, my friends, Librarianship as an undergraduate course is not the easy way to a UP degree; but since a chance was given, I had to prove myself worthy of the challenge. I toiled and worked hard, understanding the concepts and applying them in various exercises designed to mold us into future information professionals. One might say that I was thrust right in the middle of the action. I was like a fish out of water; still relishing my old life back in my old college that I left for this new one—my head still filled with dreams of what-could-have-been. But despite the situation, I kept an open mind, welcomed the different possibilities that this change might bring about. As semesters wore on and my study habits gradually improved, so did my grades begin to finally pick up. I eventually realized that maybe this "abrupt change" was not so abrupt after all, that maybe an unseen guiding hand was leading me through all of this. How else can one explain the series of events that led me to the doorsteps of the UP SLIS—Mass Comm's period of application for shifting closing right exactly as I was still trying to argue my case with them; myself at the very end of my two-semesters-allowed "non-major" status; and only 3 colleges left open that were still accepting shiftees into their fold (CAL, SLIS, and CSWD). Having had a prior theater audition gone awry, and not really seeing myself as a convincing social worker, I took the best option available. And the rest was history. Looking back, having had a good one year solid run with GMA Network as one of its news librarians, and followed by an 11-year stint (and counting) with the Senate as a Legislative Staff Officer in the Library, I can say I have had a professionally rewarding 12 years of practice as a librarian. Armed with a degree in Library and Information Science and the approval of the PRC's Board for Librarians to practice Librarianship, I was able to help shape public opinion (at GMA) and help craft relevant pieces of legislation that affect the country's future (in the Senate) in my own little way, by providing the much needed information at the right time. As libraries continue to prove themselves valuable both in the corporate world and in government, as go-to-places for research, so too, do I find myself thriving. With every question posed to me—a legislative history of a Republic Act, a profile of a senator, a book on the constitution—I discover my inner child again; that child who relished finding new discoveries. For in every page of a book I read, history is discovered. Even the most mundane of trivia interests me. My stint covering the various quiz bees during my elementary years can attest to that; the love of information for the sake of information itself. Why, looking back I was already making lists and inventories of children's books I owned when I was in elementary; color-coding the covers of my fiction books back in high school, haha! So yeah. It was not an epiphany, a mid-morning realization, or even a lightning-amidst-storm-clouds type of recognition back in college, that I wanted to be a librarian. Looking back, it was something more than that. Call it Divine Providence, if you want, a profound-accident-of-sorts, or maybe just a stroke of luck. 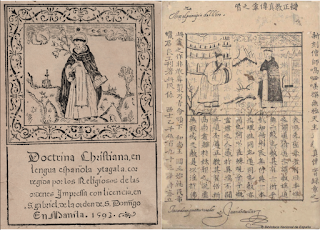 Today, many of the rare books on the Philippines are now available online. 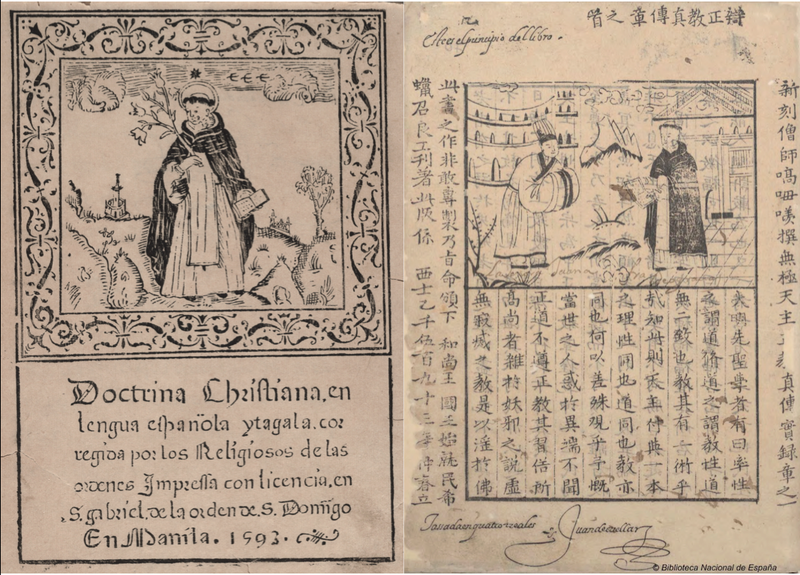 Some are copied out by Project Gutenberg, while others have been scanned and are downloadable free from the Biblioteca Nacional de España and other websites. The National Library of the Philippines has many important Philippine materials available online for free, while the Filipinas Heritage Library has its digitized books available online for a minimal fee, the Lopez Museum and Library has its major holdings scanned and can be consulted in-house. It is difficult, however, for those reading the column—whether in print or online—to appreciate his point because there are no links that lead to the rare books to which he refers. Even if readers are able to Google the sites he mentions, it is not necessarily easy to find the books on the Philippines that have been digitized. So here's a little public service: the same paragraph with clickable links (and some instructions) that will make it easier to find rare books on the Philippines. Why Did I Become a Librarian? Last month, I was asked to write a short essay on my favorite place in Ateneo. I ended up writing not so much about the Ateneo libraries I used to frequent when I was growing up, but how my favorite places influenced my own journey to becoming a librarian (see "Laman ng Lib"). I am reproducing the essay below, with links to posts I've written in the past, to (re-)introduce myself to the old and new readers of this blog. Feel free to leave comments on Facebook. Grade 2 pa lang ako, laman na ako ng library. The first book I ever borrowed at the Grade School library was The Melted Coins, a Hardy Boys mystery (see "Five Things About Vonjobi"). After finishing the entire series sometime in Grade 6, I was allowed to borrow a few books, including Robert Ludlum's The Scarlatti Inheritance, from the restricted faculty collection by appealing to Ms. Grace Valente, the first librarian I asked to bend a rule for me. At the High School library, I never had to ask for special permission to borrow books, but it probably wouldn't have been difficult because Mrs. Inday Lara, the librarian, was my father's childhood playmate. One book that I will never forget is William Goldman’s Adventures in the Screen Trade, which introduced me to the practical aspects of filmmaking in an engaging, non-technical manner (see "Meme: Books I Own and Love"). I liked it so much that I borrowed and reread it every year. If the yellow borrower's card at the back is still there, you'll see that I signed my name consecutively. When I moved on to the College, I was happy to finally become a legitimate user of the Rizal Library. I had been able to use it a few times as a high school senior, but I always felt like a guest afraid to overstay his welcome. This time, however, I could browse the books without having to sign in and indicate what my research topic was. In particular, I liked looking at books that had just been returned, which I took as an indicator that they were worth reading. That's how I found Ogilvy on Advertising, which opened my eyes to the realities of communicating with potential customers, even before we had to discuss the subject in class. It was then that the period I call my "wandering in the desert" years began. I taught high school religion at the Jesuit-run Sacred Heart School for Boys in Cebu for a year, joined the Social Security System for a few months as a consultant (and vowed to avoid government jobs forever), worked as a quality supervisor in a call center for an even shorter period, edited books for publication as a sideline, and explored the possibility of getting an MA in Theology or an MBA. The last option got me thinking about what I really wanted to do with my life. Further discernment led me to ask two questions: "What do I really like doing?" and "What can I see myself doing 10 years from now?" The answer to the first question was "I love reading books," but it was obvious that there was no career in reading for me. Then I remembered my library experiences as a student, and I wondered if there was such a thing as a master's degree for librarians. Google told me there was such a thing, so I enrolled in 2002, finished my graduate degree in library and information science by 2004, took the PRC Board Exam for librarians, got my license to practice, and eventually left for Canada to study for a PhD in book history (see "In My Life, 1999-2009"). A few relatives and friends urged me to stay in Canada after obtaining my degree, but I knew that I wanted to work in the Philippines. But where? My doctorate rendered me overqualified for most librarian jobs, except for the largest universities. However, as a blue-blooded Atenean, former Jesuit wannabe, and government-averse Filipino, I could not imagine working for De La Salle University, University of Santo Tomas, or University of the Philippines. There was really only one option: Ateneo de Manila University. Fortuitously, Mrs. Lourdes David, the Rizal Library's Director, was retiring soon, and a search committee had been formed to look for her replacement, preferably someone with a PhD. In my application, I emphasized that I was an Ateneo alumnus along with my other qualifications, and hoped for the best. And so it happened that 30 years after I borrowed my first library book, almost 20 years after graduation, and exactly 10 years after asking my second question, I was hired to do something meaningful that I enjoyed doing. I've been asked, "Bakit mo iniwan yung magandang trabaho mo sa Makati?" (Why did you leave your nice job in Makati?) 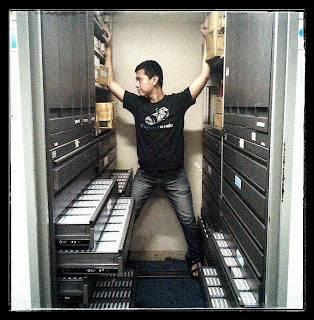 and "ME ka, bakit mo gustong mag-pari (or mag-librarian)?" (You're a Management Engineering graduate, why do you want to become a priest (or a librarian)?) and "Nasa Canada ka na, bakit bumalik ka pa ng Pilipinas?” (You were already in Canada, why did you return to the Philippines?) The answers to each of these questions can be the subject of separate articles, but they are all essentially products of the process of discernment that I learned as an Atenean and as a Jesuit wannabe. Over the years, I've identified with Joseph, who was sold into slavery in Egypt, but eventually found his way back to Israel. I tell people that I've gotten lost and taken some wrong turns over the years, but somehow, for some unknown reason, God takes care of me... whether I deserve it or not. And this is how I know that God does, in fact, write straight with crooked lines, with long detours, and with borrowers' cards. St. Ignatius was right. We can, in fact, find God in all things. Even in the library. 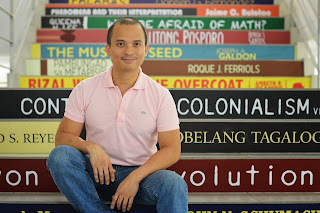 Vernon Totanes is the Director of the Rizal Library. He obtained his PhD degree at the University of Toronto, and his master's degree in library and information science at the University of the Philippines. He is an alumnus of the Ateneo de Manila University (GS 1987, HS 1991, BSME 1995).